Found a bunch of Woodworking Mags! I was searching the free section of Craigslist as I always do. I look on there all the time trying to find wood or old furniture that I can use. I take the stuff and repurpose it for things that I make and try to sell. 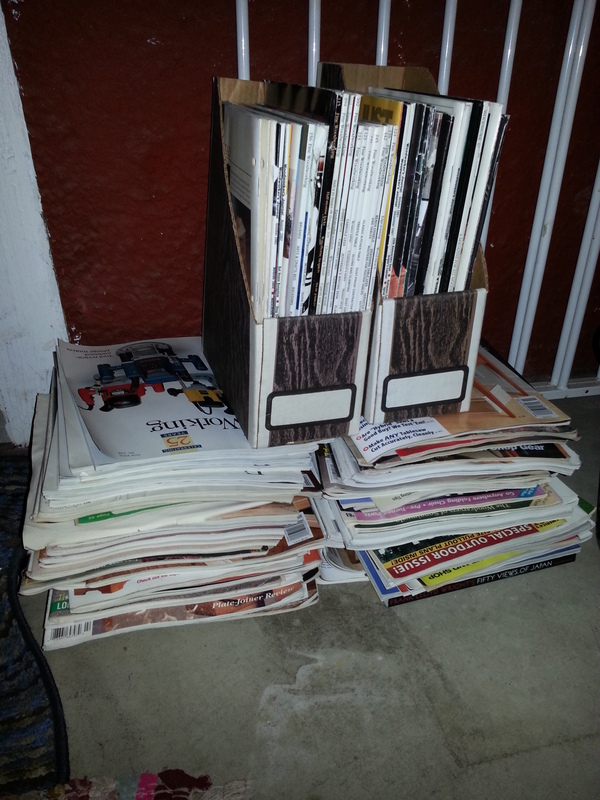 So I found someone giving away a bunch of old woodworking magazines. I thought that I would like to look at them for all the plans they usually have in them. I was thinking that he would have a substantial amount but man was I wrong! The pic only shows about one tenth of them. I have just looked at a few and the earliest I saw was 1990. In just a few years my how things have changed. Well I guess 23 years really but a lot has changed. Just the feel of the paper alone and the typeface. There is a big difference in the color and the projects. Not to mention the tools that we have now. I don’t think I realized how much different tools are until I saw the adds. I mean I knew but to see the difference in print is another thing. I know that some tools never seem to change like the planes and chisels. Even those have had some advances in the ladt few years. By seeing those I realize that I still think like I am 20 years younger than I am! I just thought I would share what I think is a interesting story. So if you are lookking for a old woodworking magazine and can’t find it just send me a message and I will look and see if I have it. Thanks for reading and have a great day! Previous Previous post: “Update” I just want to rant a little about Foam-n-More!